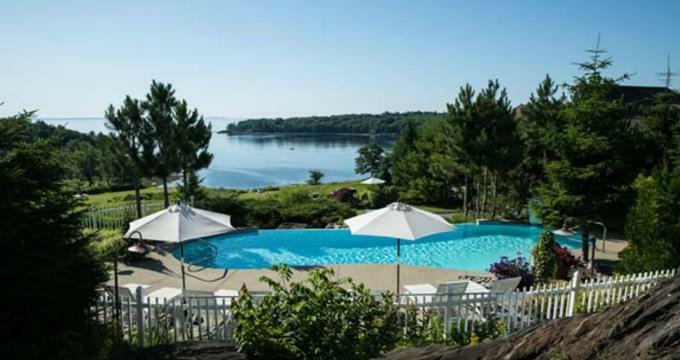 Situated on 23 acres of lush hillside overlooking a serene tidal cove at the shores of Penobscot Bay, Island View Inn is a contemporary hotel that offers bright, nautically themed accommodations with private balconies and beautiful ocean views. The hotel also provides individual cottages and houses for families and groups of friends and has an outdoor heated infinity swimming pool and pretty garden trails. In-room amenities include cable television, mini fridges, and complimentary wireless Internet, while hotel amenities include complimentary refreshments in the morning, continental breakfast (for an additional fee), a comfortable lobby and lounge with a fireplace, and free parking. Island View Inn is ideally located for exploring the tranquil seaside town of Camden, which is just five miles away, and its attractions such as the Farnsworth Art Museum and the Owls Head Lighthouse. Island View Inn features stylishly appointed ocean-facing guest rooms overlooking the picturesque Penobscot Bay near Camden. Guest rooms have comfortable king size beds with fresh linens, and en-suite bathrooms with bath/shower combinations, clean towels, and branded bath products. Living rooms open onto balconies or patios with table and chairs, and modern amenities in every room include air-conditioning and heating, mini fridges, televisions with cable channels, hair dryers, irons and ironing boards, in-room telephones with free local calls, and complimentary wireless Internet. Guests can enjoy complimentary coffee and tea every morning, and a continental breakfast is available for an additional fee, which includes fresh seasonal fruit, hot and cold cereals, homemade granola, yogurt, assorted bread for toasting, and homemade pastries. Amenities at the Island View Inn include an outdoor heated infinity swimming pool and pretty garden trails to explore. Guests can enjoy complimentary coffee and tea every morning, and a continental breakfast is available for an additional fee, and in-room amenities include air-conditioning and heating, mini fridges, televisions with cable channels, hair dryers, irons and ironing boards, in-room telephones with free local calls, and complimentary wireless Internet. The Island View Inn is located on the shores of Penobscot Bay in the picturesque village of Rockport, which offers an array of activities and attractions for the whole family to enjoy, ranging from museums and art galleries to restaurants, cafés, and a variety of recreational and outdoor fun. The picturesque seaside town is home to a quiet and beautiful harbor filled with schooners and fishing boats and is renowned for its artists’ community, whose works are shown in numerous galleries and exhibitions in and around town. Outdoor lovers can hike and bike one of the many paths and trails around the city and further afield, while fishermen can fish off the harbor piers or take to the sea on a fishing charter. Other things to see and do include a sunset schooner cruise on the 65-foot Schooner Yacht Heron, visiting Rockport Marine Park, which is home to several historical landmarks and offers day trips and sailing cruises, or enjoy a performance at the Rockport Opera House, which presents dance, music, plays and other activities all year round. The nearby town of Camden also offers several attractions and activities, such as the mile-long Rockland Breakwater, the Camden State Hills Park, the Farnsworth Art Museum, and the Penobscot Marine Museum. Other attractions include the Owls Head Transportation Museum, the Merryspring Nature Center, and the Center for Maine Contemporary Art. There are also several scenic hiking trails and lighthouses such as Marshall Point and Owls Head.